The Coachella Valley in California is known for being the home of a certain music festival, but few people booking their first trip to that festival realize it is also home to countless date farms. Dates are the oldest-cultivated fruit, but they only made it to California after 1898, when the US Department of Agriculture sent out some guys to collect exotic plants from around the world to bring back for cultivation in America, including mangoes, avocados and, you guessed it, dates. Inspired by One Thousand and One Arabian Nights, a book that had enchanted many stateside with its stories of Aladdin and Sinbad, set against a landscape rich with date palms, the men charged with bringing back dates went straight to Baghdad, Iraq. Date palms in Coachella Valley, Calif. Dorothea Lange/Library of Congress, via NPR. Sumerians first began their relationship with the date palm, a tree that towered up to 100 feet and could live up to 200 years, as early as 4000 BC, 5,000 years ago. Over time, they wound up with some 150 words to describe the different types of date palm and their different parts, a fact apparent in what Karen Rhea Nemet-Nejat refers to as the ancients’ “lexical texts,” in her book, Daily Life in Ancient Mesopotamia. Nonetheless, they called the date palm (phoenix dactylifera) gishimmar, and its fruit, zulum. This (Mesopotamia) Must Be the Place! Such criteria made Lower Mesopotamia in the Tigris and Euphrates delta—where summers are dry, winters are mild, and irrigation was already a thing—the perfect location for the date palm to thrive and become a symbol of fecundity and success, as well as a vital part of the economy. Even with the perfect conditions Lower Mesopotamia provided a date palm, however, it still took the plant four to six years from planting time to bear fruit, along with some 15 to 20 years to reach full productivity. To give some perspective, full productivity for a date palm is an annual output of about 45 pounds (20kg) of fruit per tree. For a plant that played such a vital economic role to so many people, it’s hard to imagine that such yields were enough to, one, support such thriving civilizations, and two, reach quintessence status. Moreover, a natural palm grove features an even split of half female and half male trees. Such groves rely on Mother Nature to carry the males’ pollen to the females’ flowers via the wind or pollinating fauna. Needless to say, date palm yields were dependent upon which way the wind blew or how frisky a bee felt, something no bustling civilization could (or should, if it could help it) rely on. 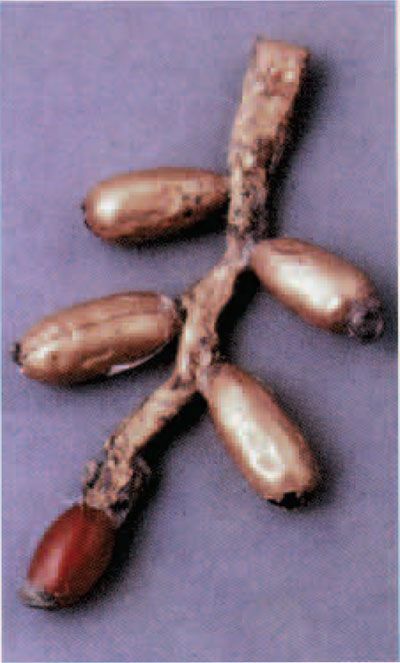 Enter the quintessential Sumerian genius that increased yields and established a practice still in use today: artificial pollination. To combat the uncertainty of nature, Sumerians took up artificial pollination. It sounds a lot more complicated than it was/is; all it took was grabbing a male plant, climbing up a female’s trunk and smearing the pollen from the male plant onto the female’s flowers. This not only ensured maximum yields regardless of Mother Nature’s whims, it also allowed for cultivators to have a lot more of the productive female trees per acre in their groves than male ones (a ratio of 49 females to one male). It is believed that the date palm may have represented fertility in humans in ancient Mesopotamia. (Source) This is a safe assumption to make, considering the symbolism of the sacred marriage ritual which took place each spring for the Sumerians and all those following them. For the sacred marriage each spring, people gathered at the new year festival and watched the king’s procession from his palace to the city’s temple of Inanna (Ishtar), where he would meet up with the Mesopotamian goddess of fertility (represented by a high priestess) and be led into the temple to consummate the symbolic marriage of the god Dumuzi (Tammuz) and goddess of fertility. This is a symbolic effort to ensure that the coming year is a productive one. Dumuzi’s association with the date palm extends to him being worshiped as Ama-ushumgal-anna, the power of the date-palm, by cities across Mesopotamia whose economies relied heavily on the date palm. Further, Inanna was considered “the one who makes the dates be full of abundance.” Both Dumuzi and Inanna are represented by date-palm paraphernalia; Dumuzi a date cluster or heart of palm, and Inanna a palm frond. 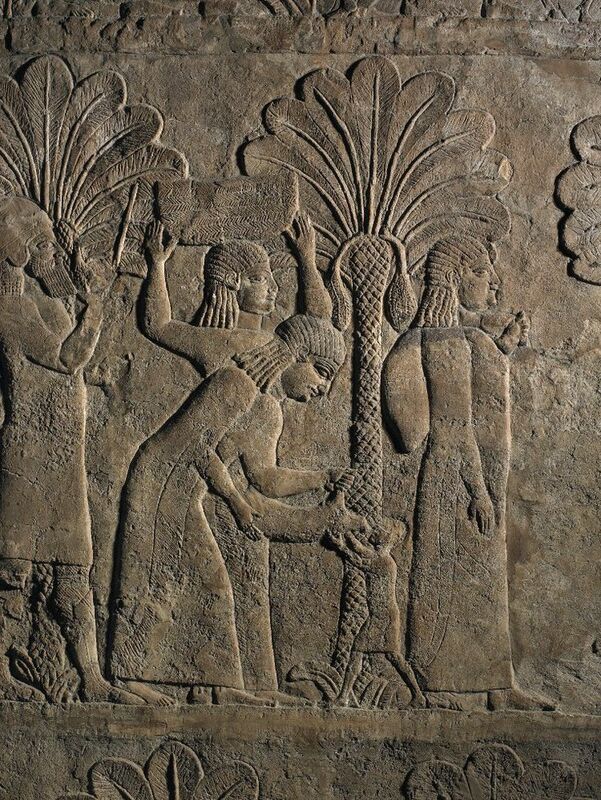 Dumuzi and Inanna weren’t the only gods associated with date palms and their fruit. Mylitta, the Babylonian moon goddess of love, beauty, fertility and childbirth, is also represented by the date palm. So, the date palm was important in ancient Mesopotamia. Let’s dive deeper into why it was so. Really, date palms needed only to stand there to be useful (oh, to be a date palm!) and provide value to their cultivators; their groves provided a canopy that shielded less-keen-on-the-fire-sky crops from the hot sun. The date palm’s sprout also brought something to the dinner table; a vegetable vaguely described as not unlike celery, which can only be the delicious heart of palm. Then we have the date’s high sugar content. We may villainize sugar today, but in the ancient world, sugar, and a lot of it, was prized for its ability to be a preservative while also, of course, satisfying a sweet tooth. That sweet tooth was satisfied through a sweet sap known as lal that came from the dates, and was a less dear sweetener than honey. I feel this is a good spot to mention that one royal delicacy was dates from the Mesopotamian province of Hatra, stuffed with almonds. Even date date pits were valuable, for they could either serve as food for livestock or could be made into decorative jewelry. In fact, to further drive home the latter, such pits were found in the Royal Cemetery at Ur. And if all that doesn’t impress you, perhaps knowing that dates were also used to make alcoholic beverages will. 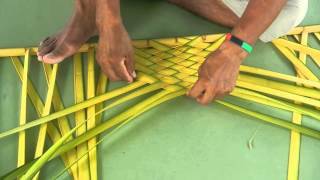 All this and we haven’t even gotten to the date palm’s resourcefulness as a building and manufacturing material, thanks to its by-products of leaves, fiber and timber. Palm trunks were used to construct the temple of the moon god at Ur, and Mesopotamian homes were constructed with the palms’ trunks and fronds. Needles and thread came from the date palm, which surely helped in the production of baskets, mattresses and rope. In the JSTOR article where I found the above excerpt, Stephanie Dalley argues that the Hanging Gardens of Babylon were not built in Babylon as has been the belief for centuries, but rather at Nineveh in Assyria, which was known as “old Babylon” in 700 BC. I mention this seemingly irrelevant detail, because to support her argument, Dalley includes insight and details about the date palm in Mesopotamia that I hadn’t come across anywhere else. The date palm continues to be important in modern-day Mesopotamia, aka Iraq. It is part of the landscape, towering over gardens and prominent in art (as you’ve noticed by All Mesopotamia’s logo, designed by Nadia Khafaji). Its fruit is celebrated with festivals and is a staple of the Iraqi sweet tooth that can be satisfied with the date or through the quintessentially Iraqi date syrup/molasses known as dibis. The date palm has a definite (albeit decently long) lifespan, but it has immortalized the Sumerian genius of working with nature and helping it along for humanity’s benefit.